You can be a Packers' fan and not have a cheesehead to wear to games - but it is encouraged. 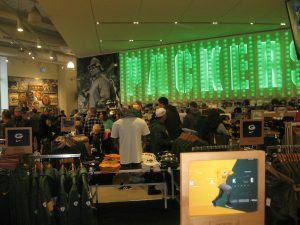 And the Packers' Pro Shop had plenty to sell. We had a great football weekend in Green Bay a few days ago … until the actual football game. That’s a summation of our trip to Wisconsin to see the Packers and Bills square off. Lambeau Field has become the Wrigley Field of the NFL, with its rich history that dates back to 1957. It’s the oldest stadium in the NFL, and is on the list of must-see attractions for football fans. On a personal level, it was a chance to spend a little time with Packers’ president Mark Murphy – my friend at Clarence Central High School. A group of his classmates and their spouses made the trip to Green Bay to catch up with him and his wife. I’m not going to say that we had a typical Lambeau Field experience because of that, but we learned a lot about the place during our visit. 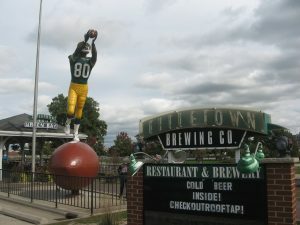 We arrived in Green Bay on Friday night, and had dinner at the Titletown Brewing Company in downtown Green Bay. It’s just a few steps from the giant statue of former Packers’ wide receiver Donald Driver. That’s appropriate, since it is near Donald Driver Way. Vince Lombardi, Mike Holmgren and Mike McCarthy – Super Bowl-winning coaches – all have streets named after them. Donald Driver looks open as he hauls in another reception. By the way, the restaurant is located in the old railroad depot, where thousands greeted the Packers after they won a world championship one year in 1929. History is ever-present in Green Bay. For example, I struck up a conversation with a local resident who told us she went to the same church as Vince Lombardi and some of the players. In fact, Jim Ringo used to answer questions from the kids each week when he stopped by the church. At 3 p.m., a good-sized group of Mark’s high school and college friends met at Lambeau Field’s atrium. It was packed with others visitors who wanted photos of the statues of Lombardi and Curly Lambeau and/or the chance to see the stadium and the Packers Hall of Fame. A couple of guys dressed up in leather helmets and “Acme Packers” shirts to pose with tourists. I had visited the building in 2011, but a $312 million renovation had been done since then so there was much to see. Mark led us on a 90-minute tour of Lambeau; it was a chance to get the routine down since he would take Kim Pegula on a similar trip only minutes after he was done with us. Our first impression of the facility is that it is sparking clean, at least by stadium standards. Even the working area under the stands is more or less spotless. The Packers spend about $13 million per year on such maintenance, and it shows. The lower bowl remains about the same as it was in the Lombardi days of the Sixties – no benches or balconies. It gives the place authenticity. But above it are a great many suites and club seats that Lombardi wouldn’t recognize. One end zone had some new suites and seats added a few years ago, raising the seating capacity to around 81,000. That helped reduce the Packers’ waiting list for tickets a little, but it still includes about 133,000 names. Considering only 100 tickets per year become available, parents put their children on the list right after they are born – and cross their fingers. Every fan at a game is allowed to visit the top of the new section in one of the end zones – just under a massive scoreboard. The views are as good as you’d think they are, since people are at the highest point in the county. It’s a long way down to the field from this viewpoint at Lambeau Field. Plunging downstairs from there, it is always a funny feeling to be at field level of an NFL stadium. Tours are only allowed on the warning track, naturally, but visitors are still looking up at 81,000 seats. I’ve heard that players get used to the feeling rather quickly, but it does make quite a first impression. We also walked through a roped-in area in the middle of the Packers’ locker room, which is shaped like a football. As for the facilities, they are jaw-dropping and state of the art. The weight room, which apparently will be expanded soon, is already bigger than a high school gym. A full kitchen is open for those who want to eat meals there. 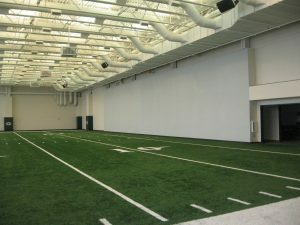 A large indoor room has lined artificial turf on the floor and has a huge screen on one wall. The Packers, therefore, can see for themselves what happened on a particular play and immediately walk through it in an attempt to correct the problems. This movie theater/football field is supposed to help the Packers win games. One little episode was instructive. We were walking through the players’ entrance, and one player I didn’t recognize was talking to some friends. He said that the facilities were vast, and they were all solely designed to help the team win. It’s fair to say that the Bills haven’t had that level of commitment at times in their history. We walked through a storage room full of Packer merchandise, and came out through a side door into the Pro Shop – surprising an employee who already had plenty to do handling the mob. Mark said every good tour ends up in the gift shop. The souvenir area doubled in size during the renovation, and it now seems about as big as a J.C. Penney store. The merchandise is a little pricey – you can do better down the street at Kohl’s – but you can’t beat the selection. Apparently fans agreed, because there was a huge line to the checkout area that looked as if it needed 30 minutes to navigate – even though there were something like 16 cash registers ringing up sales. It sure looked like a license to print money. It’s difficult for a Packers fan to walk in here without opening up a wallet. The Packers started buying real estate just west of Lambeau Field about 10 years ago. Three years ago, they went to work building the “Titletown District.” Phase One is about done, and it’s downright visionary. Yes, there are businesses there – Hinterland Brewery, the Lodge Kohler hotel and the Bellin Health Sports Medicine and Orthopedics clinic. We had dinner on Saturday at the Brewery, and it’s a very impressive operation. But quite a bit of space in the district is devoted to recreational activities. For example, there’s a 46-foot tubing hill designed for use in the winter. That’s the Packers’ answer to fans’ requests to have more to do in the winter months. The area also has a football field, a 40-yard dash area, and some playgrounds for assorted age groups. There’s more to come. The Packers are teaming with Microsoft on a project called “Titletown Tech.” Soon construction will begin on apartments and town houses. That will be followed by other commercial development. The project is rather typical of the team’s operation. It is a community-owned, non-profit organization, and stresses that in its operations. Therefore, the Packers are very visible in the community. When a new convention center opened in downtown Green Bay, fans set foot in Packers Plaza before entering. The atrium has tributes to the state’s top high school coaches and teams. The project is one of the biggest development projects in the state of Wisconsin. The Packers can afford a little loss on Titletown until everything is up and running. 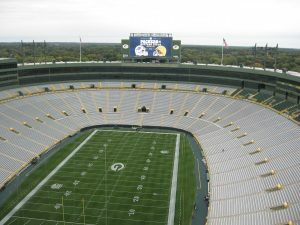 They didn’t borrow a dime for Lambeau’s expansion, and still have a fund balance of $380 million, according to Forbes magazine. Our group was told that the city’s buses ran straight to Lambeau Field on the days of the game. Not only was there a stop right across the street from our hotel, but the ride was free. It sure seemed like a great way to cut down on stadium traffic. We got there at 9:30 for a noon kickoff, and there was activity surrounding the area. One good-sized building was called “Tailgate Village,” and when we walked in a band was in full flight of its tribute to AC/DC. Yes, food and drink were available to customers. Fans were allowed into the stadium at 10 a.m., and the process was orderly and easy. Stadium staff was extremely polite, pleasant and helpful. Again, everything was clean – to the point where someone was constantly cleaning the rest room. 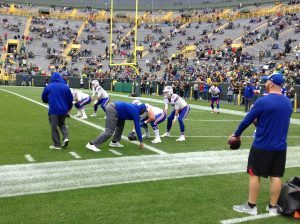 Josh Allen warms up for Sunday’s game with the Packers in Lambeau Field. It wasn’t a day to remember for the young Bills quarterback. Our seats were almost 20 rows up in the corner near the end zone, which was high enough to have a view of most of the action. When we couldn’t see, there were always the television screens in the scoreboard. In other words, we could tell that it was a bad idea when the Bills’ Josh Allen tried to throw a 35-yard pass across his body while escaping defensive pressure. Yup, intercepted. It was the first 22-0 loss by a Buffalo pro football team since the Bisons dropped a game by that count to Pottsville Maroons in 1927, and the first 22-0 score in the league since 2005. At no point did it look as if the Bills were going to win. But at least we had more time that way to soak in the experience of a game. For instance, Lambeau Field must be the only NFL stadium that features a sing-along of “The Beer Barrel Polka” between the third and fourth quarters. No-shows are rather rare for a Packers game at Lambeau Field. Football fans sometimes can be a little rude at games, particularly to those wearing the wrong colors. But we were happy to report that Midwestern values were very apparent, as most of the home fans were friendly. (Note: This might be different when the Bears make their annual appearance.) Cheeseheads were seen around the stadium, naturally, but a chicken wing foam hat on a Bills’ fan seemed to get good reviews from the Packers faithful. As for prices, they were rather typical of the NFL – a hot dog was $6 and a bucket of popcorn was $6.50. Fans rented seat-backs for $6 to make the gameday experience a little more comfortable. The Packers sold programs for $6 as well, and it was a thick publication straight out of the 1980s when people like to read before a game. On our way out, those in Bills shirts were thanked for Buffalo’s win over the Vikings the week before. Then it was on the crowded free bus (90 people or so on board), and away we went back downtown. We were in our hotel rooms before 4 p.m., which was very impressive. 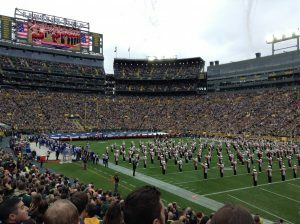 Airfare to Green Bay is substantially cheaper on the Tuesday after a Packers’ home game than on a Monday – enough to justify another night’s stay in the town. Therefore, we took the time to look around a bit. It’s rather quiet, especially by NFL standards. Green Bay has about 105,000 people, which ranks 290th in the nation. It’s sort of like putting an NFL franchise in Waterbury, Connecticut. We went back to Lambeau Field on Monday afternoon. There we went through the remodeled Packers Hall of Fame. It’s another first-class job, with a nice film on the team’s history and plenty of artifacts. 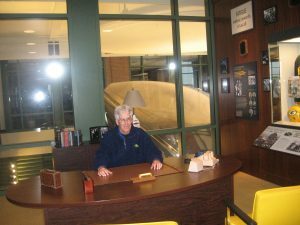 The best spot in the place might be a replica of Vince Lombardi’s desk. Yes, visitors can sit there. Yes, I did. When you sit at Vince Lombardi’s desk, winning is everything. Mark Gaughan of The Buffalo News told me earlier this year that he thought Green Bay had the best fan experience in the NFL. I haven’t been to many other stadiums like he has, but I’m convinced he must be right. We can only hope that Kim Pegula was taking notes on her tour.